It’s important you regularly worm your horse. A horse should be wormed every 6-12 weeks. I can’t claim to know all the ins and outs of the science of it, but I follow a few rules of thumb. The simplest way I find is to divide the year roughly into 4. My horses get wormed 4 times a year, two of these times I use wormers that work on tape worm. In addition I manage my pasture the best way I can, regularly picking up muck from where they are grazing. Some livery yards will make you keep your horse in for 24 hours after worming. Personally I think this is an old fashioned way of worming, many of the modern wormers take longer than 24 hours to work through the horses system making staying in pointless. Also if you are worming with powder rather than paste this often is introduced into food for several days. I use paste to worm my horses. This can be administered one of two ways. It comes in a syringe type device. This can be gently worked into the corner of the horses mouth and then pushed in. 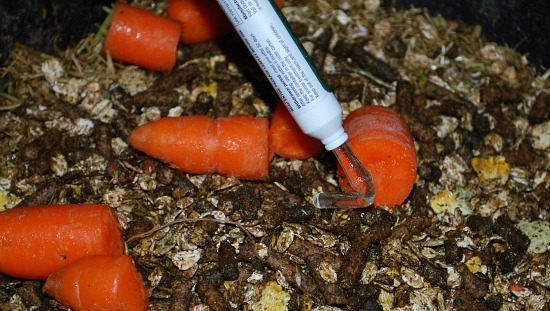 Alternatively if you have a horse that can’t stand you doing this but will happily eat the stuff mix it into its food. 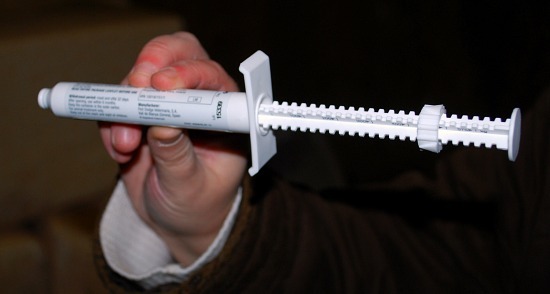 You can alter the dosage by changing where the stopper rest of the syringe – it works on a weight basis although my vet says it’s better to slightly over worm a horse rather than under worm it. I also understand you can get special worming bits where you feed the paste into the bit and it then works into the horses mouth through a hole.